Sola Sisters: Does Rick Warren Still Get Dr. John Piper's "Stamp of Approval?" Many of us know by now that, in 2010, Dr. John Piper (author of Desiring God and pastor of Bethlehem Baptist Church) gave his "stamp of approval" to Rick Warren by having Warren be a keynote speaker at Dr. Piper's annual Desiring God conference. This was an event that caught many in evangelicalism off guard and resulted in a flurry of articles and blog posts over a number of months. The problem with Dr. Piper welcoming Rick Warren into the fold is that Dr. Piper has long been known as a champion and protector of the purity of the gospel message. He has served as a trusted church leader to whom many turned in an effort to get sound, biblical teaching. This is no small thing in today's church community which is moving increasingly away from expositional teaching in favor of watered down, topical style preaching. So when Dr. Piper asked Rick Warren to be a keynote speaker at Desiring God's annual conference, it was perceived by many to be analogous to the shepherd throwing open the gate to the sheep-fold and welcoming in the wolf, rather than protecting his flock from the wolf. But now there is a new issue. According to Erin Benziger's recent article "Historic Interfaith Document" was "One Year in the Making," Rick Warren's Saddleback Church has been working on co-authoring a Muslim-Christian interfaith document ("King's Way") with the Islamic Center of Southern California (ICSC). According to Benziger's article, this document has been "one year in the making," and openly states that "The first step in the plan identifies the belief in one God." So now I'm wondering what John Piper thinks about this Muslim-Christian interfaith document being drafted by his friend, Rick Warren? For the record, Dr. Piper has historically been very clear about his stance on Islam. In fact, shortly after another recent interfaith document (A Common Word, 2008) was released, he gave a strong video statement (below) in response to it. (Please note that Rick Warren gave his approval to the Common Word document by signing the Christian Response to 'A Common Word' document.) 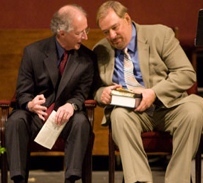 It appears that at the time A Common Word came out (2008), John Piper was willing to give his friend Rick Warren the benefit of the doubt, in that two years later he invited Rick Warren (a supporter of the Common Word document) to be a keynote speaker for him at his 2010 Desiring God conference. But now in light of this new interfaith document aimed at uniting Christians and Muslims ("King's Way"), and being co-authored by Rick Warren's own church, the question must be asked: does Dr. Piper still give Rick Warren his "stamp of approval?"